Word up, peeps! The chart pattern party is just heating up. And today, I’m serving up a couple more, with a triangle on GBP/NZD and a rectangle on EUR/NZD. Enjoy! 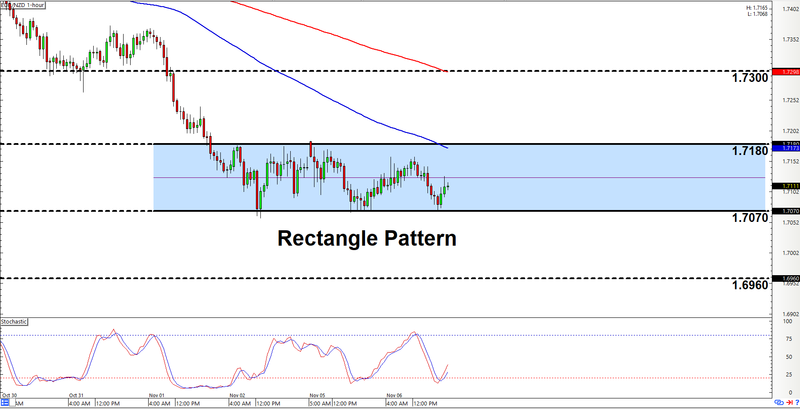 EUR/NZD appears to be trading sideways while respecting resistance at 1.7180 and support at 1.7070, which gives us a 110-pip trading range or rectangle pattern to play with. And if you’re planning to trade within the range, then you may be too late since the pair is already on its way up towards 1.7180. However, that also means that if the pair does reach 1.7180, then an opportunity to go short may present itself. Y’all may therefore wanna put this pair on yo watch list. Do note that the risk for a breakout is always there. So if 1.7180 fails to hold as resistance, then that likely means that bulls are gunning for the major psychological level at 1.7300. Conversely, if the pair moves back down and 1.7070 fails to hold as support, then bears will likely try to push the pair down towards 1.6960. Bulls have recently been trying to push AUD/CAD ever higher. However, bears have set up a defensive line and entrenched themselves at 1.9640. And so far, them bears have been successful in repelling the bulls’ upward push, forming that there ascending triangle pattern in the process. 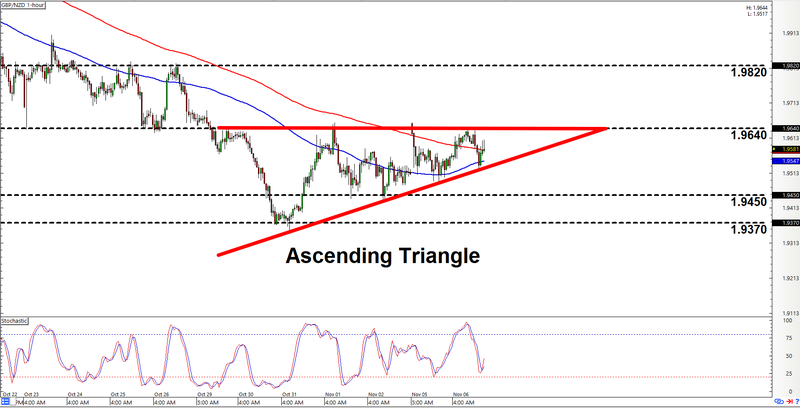 An ascending triangle is a bullish forex chart pattern, so our main directional bias is to the upside. And should the triangle break to the upside, then the resulting rally will probably have enough steam for a 270-pip move. Do note, however, that ascending triangles usually form after an uptrend. But as y’all can see, the most recent trend was a downtrend. There’s therefore also a chance that the pair may break to the downside, so y’all may also wanna prepare for a bearish scenario as well. And a move lower past 1.9450 would be an early sign that bears are winning out. The pair still needs to smash 1.9370 in order to validate the downside breakout, though.